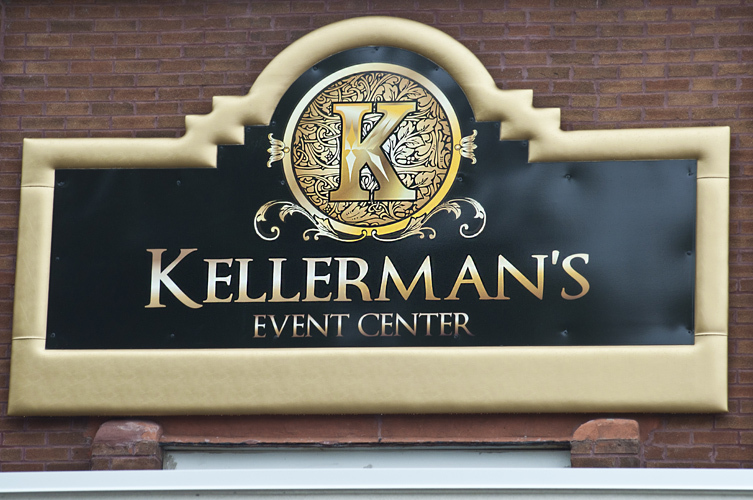 Located in downtown White Bear Lake, Kellerman’s Event Center (KEC) offers distinction, charm, and a unique atmosphere for any event. The flexibility of the space is perfect for gatherings from 40 to 250+ people. The banquet facility highlights the building’s historic architectural features with warm colors and textures of wood and brick, stunning archways, high ceilings, wood floors, a rooftop deck, and windows that overlook the city of White Bear Lake. For small outdoor weddings and cocktail receptions, a beautifully-landscaped courtyard reflects an old world, European outdoor bistro. • Reception Social/Sitting Area with beverage service. • Ballroom – 4,000 square feet with original wood floor. • Dinner Seating from 40-250. Cocktail style 300. Theater seating 400. • 2000 square feet of pre-function bar/social area and meeting space. • Over 7,000 square feet of private event space. • Indoor wedding ceremony setup. • Elegant Bride’s Room with private bath, 8-foot mirrors, dressing and sitting area is included with a wedding ceremony. • Groom’s Room with Pool Table / Locked Gift Room is included with wedding ceremony and/or reception. • 17-foot exposed fir ceilings on bow string trusses. Open ceiling provides natural lighting. • Exposure of original brick and windows overlooking landscaped courtyard. • Grand entrance staircase with double doors . • North window alcove with charming sitting areas for socializing or additional dining space. • Courtyard access is included with venue rental. Courtyard area for small ceremonies, cocktails, and socializing. • Unique, hand-crafted European facades and elegant café lights throughout the ballroom. • Exquisite antique furniture provided for sitting areas throughout the venue – yours to arrange. • The Alchemist Craft Cocktail Parlor on premises. • Personalized wedding packages are available. • Complete room setup and tear down, inclluding tables and chairs. • Jumbo screen with rear projection and hand-held wireless microphone. • 10 consecutive hours on Friday or Saturday; 12 hours if wedding ceremony held at KEC. • All events require security. The cost is $400 for a 4 hour minimum. Additional hours may be required. All events must adhere to the policies and are subject to the discretion of Kellerman’s Event Center. • A usage fee will be included on all vendor invoices for food, non-alcoholic beverages, linens, china, drapes, chair covers, and other incidentals. This amount (15% in 2018 & 2019) will be paid directly to Kellermans by the chosen vendors. • If it becomes necessary to supervise any children during the event, Kellerman’s will charge for this service, which will be deducted from the refundable deposit. • If the wedding ceremony will be held at Kellerman’s, a ceremony fee is required. Includes 1-hour rehearsal on designated day. • An EVENT COORDINATOR IS REQUIRED for all wedding ceremonies and/or receptions held at Kellerman’s Event Center. The fee is $90/hour for 2018 and $100/hour for 2019 and is paid separately to the assigned Event Coordinator. There is a 4 hr minimum for reception only, and a 5 hr minimum for ceremony and reception. Considering Kellerman’s Event Center for your wedding?